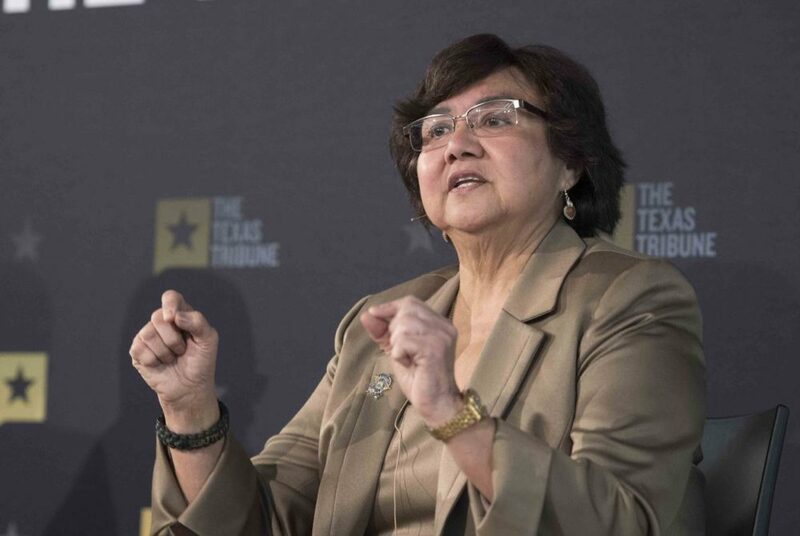 Democratic governor candidate Lupe Valdez of Dallas answers audience questions at a Texas Tribune event on Jan. 18, 2018 at Capital Factory. Democratic gubernatorial candidate Lupe Valdez sat down Thursday with Texas Tribune CEO Evan Smith for her most in-depth interview since entering the race in early December. Valdez is considered one of the frontrunners to win the nomination to challenge Republican Gov. Greg Abbott in November. On Thursday, she spelled out some policy positions and avoided criticizing one of her main competitors for the nomination, Houston businessman Andrew White. As governor, Valdez promised to try to raise the minimum wage in Texas, which is currently $7.25 an hour. She said the state should “start out with a livable wage.” Pressed for a specific figure, Valdez suggested “somewhere between $12 and $15” per hour. Valdez said she was open to pursuing a tax increase to generate more state revenue — “if necessary.” However, she made clear she would not support a state income tax in Texas. Speaking with reporters afterward, Valdez said she could not yet foresee a scenario that would require her to seek a tax hike. Still, she defended the possibility. Valdez said there is a “happy medium” in the discussion about whether undocumented immigrants should be deported, expressing sympathy for those who come to the country seeking a better quality of life. Clearing up her refusal to answer a similar question Sunday on the campaign trail, Valdez said she does support providing driver’s licenses to undocumented immigrants. “But with limited access,” she added, explaining that such licenses shouldn’t be used for non-driving activities, such as voting. White, a Houston entrepreneur and the son of late Gov. Mark White, is one of Valdez’s higher-profile primary rivals. She argued that her tenure as sheriff gives her more relevant experience than he does, but declined to criticize him on an issue that has put him at odds with some Democrats — his contention that he is “personally pro-life” but respects a woman’s right to choose. “I don’t have to beat up a person to beat them,” Valdez said, while emphasizing she believes no one should be told what to do with their body. Like White, Valdez said she supports ending the death penalty in Texas, expressing concern about cases of wrongful execution. “We cannot be in a situation where we risk killing an innocent person,” Valdez said. Asked about her paltry fundraising so far — she raised just $46,000 in the first few weeks of her campaign — Valdez insisted that she did not prioritize it because she still had to serve as sheriff through Jan. 31. “You need to continue to take care of the department, and I did that until the very last day,” she said. Since then, she added, she’s been raising about $300 to $500 a day. Her campaign later clarified that the rate is much higher. Valdez said she would not zero out the $800 million that Texas spends every two years on border security, as White has suggested he would do. Instead, she said, she would redirect some of the money to local law enforcement agencies to help them do their jobs. Valdez said she is against open carry and campus carry but supports concealed carry, citing her long experience as a member of the law enforcement community. She added that she supports increased background checks on gun purchases as well as a ban on high-capacity magazines.